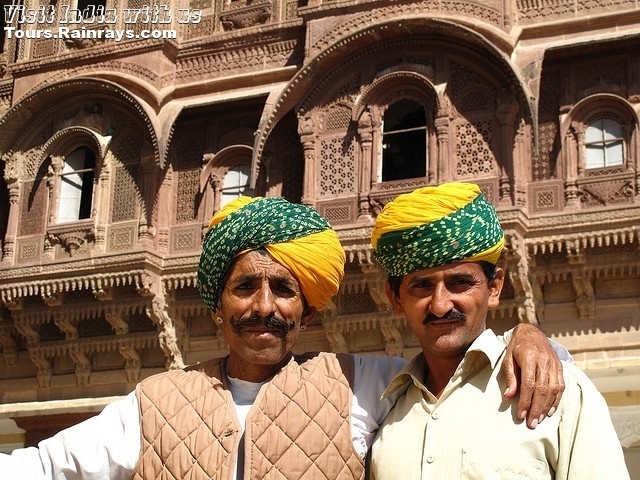 Mehrangarh Fort is one of the largest and most magnificent Fort in Jodhpur city in Rajasthan state. 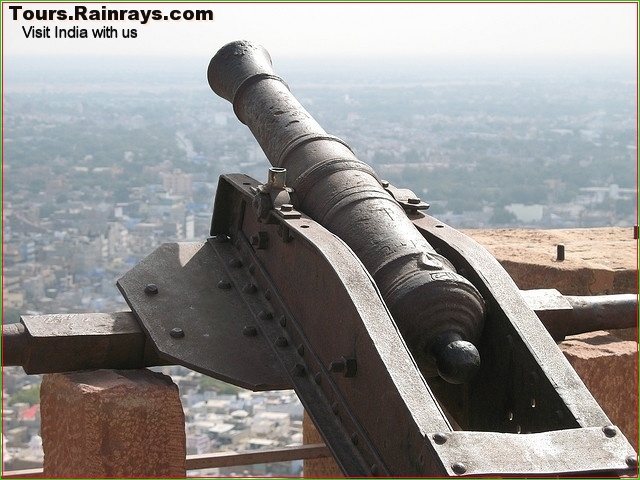 Location : The Fort is located just 400 feet (122 m) above the city Jodhpur. It can be reached from the city, 5 kms below, through a circular road. 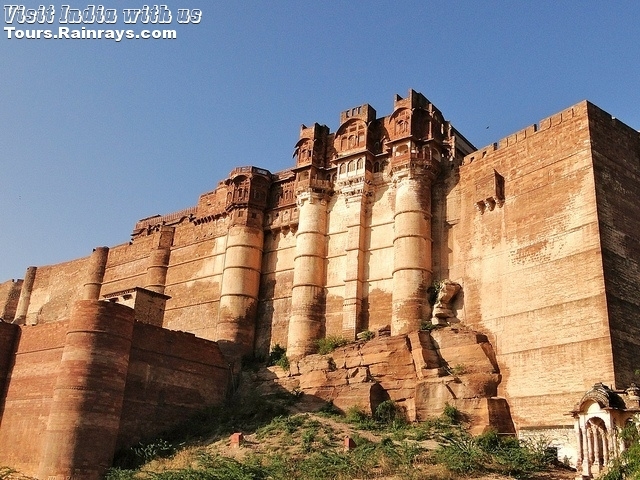 This is a 15th-century and one of the colossal and majestic forts of India. 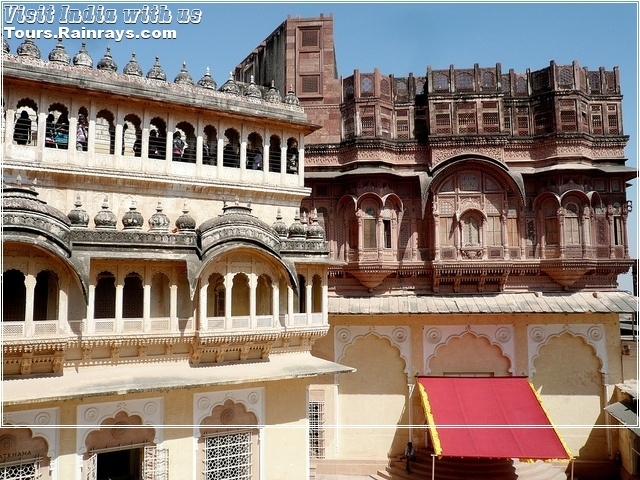 Rao Jodha was buit this fort in 1459. 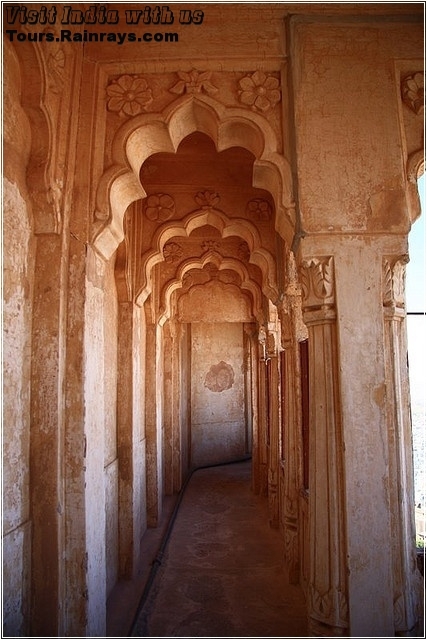 Inside the fort boundaries there are many palaces that are well known for their intricate carvings and expansive courtyards. 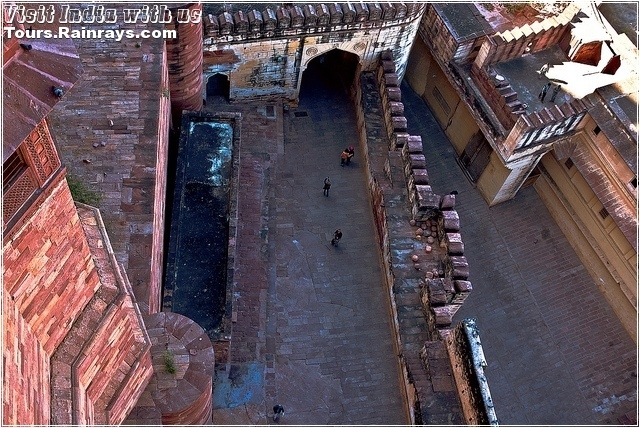 Mehrangarh fort has seven gates, some of which still stand as a witness to the battles fought by the armies of Jodhpur. Famous gate of this fort is known as Jayapol that mean "victory" or "Gate of Victory". This gate was constructed by Maharaja Man Singh to celebrate his triumph over the armies of Jaipur and Bikaner. Second gate of the fort still stands witness to canon ball hits by attacking armies of Jaipur during wars. Loha Pol or Iron Gate is the main entrance to the fort. Fateh Pol was built to celebrate a victory over the Mughals in 1707. 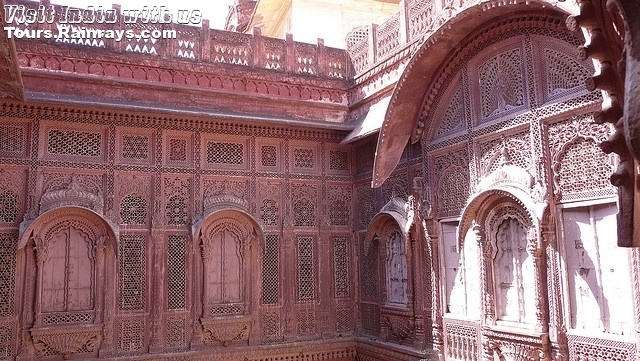 It is a houses a number of palaces inside, with extensive patios. 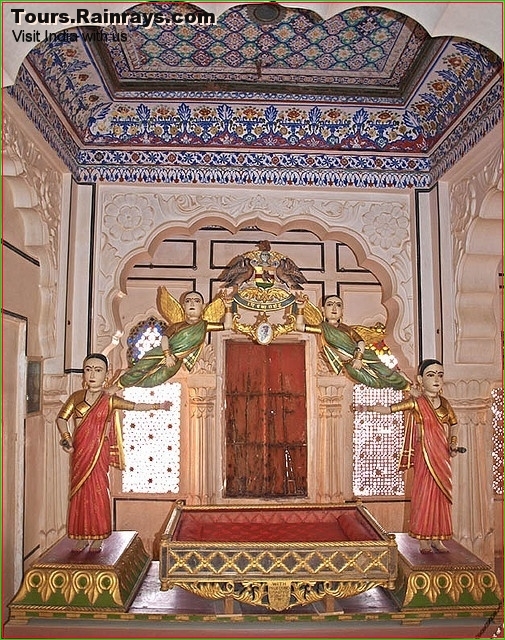 The main palaces of Mehrangarh Fort are Phool Mahal, Moti Mahal (Pearl Palace), Sheesha Mahal, Sileh Khana, Daulat Khana, Takht Vilas and Jhanki Mahal. 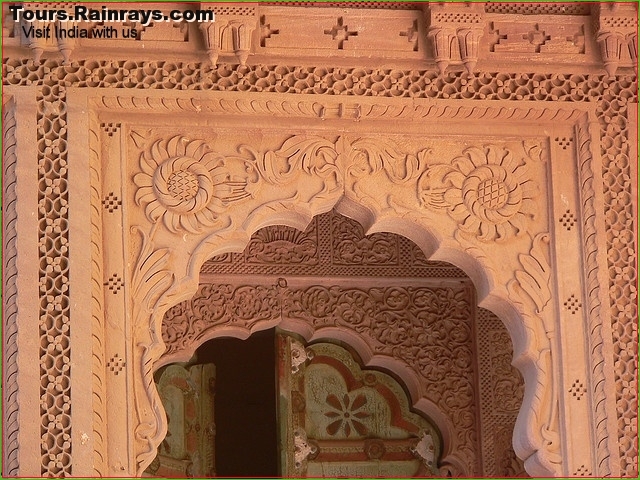 Moti Mahal : During the 1595–1619, Raja Sur Singh was built this palaces. 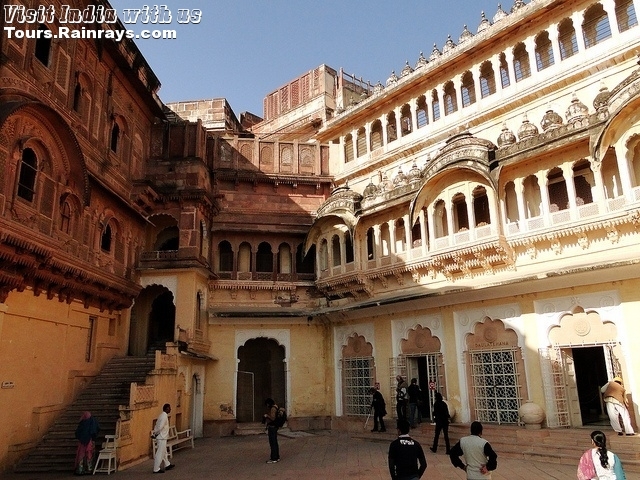 It is the largest palaces of Mehrangarh Fort. 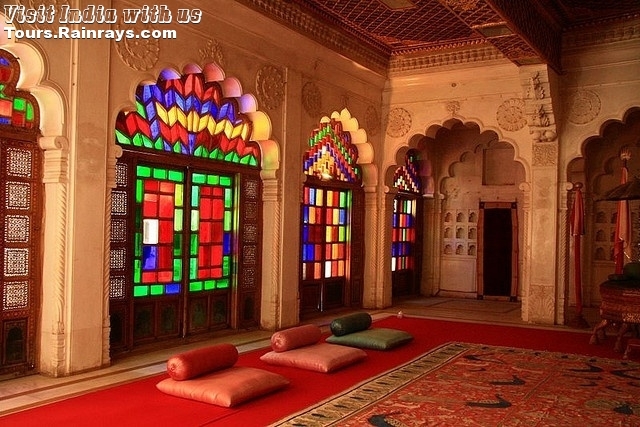 Sheesha Mahal : Sheesha Mahal or Mirror Palace is a perfect example of a typical Rajput Sheesh Mahal and made of mirror. 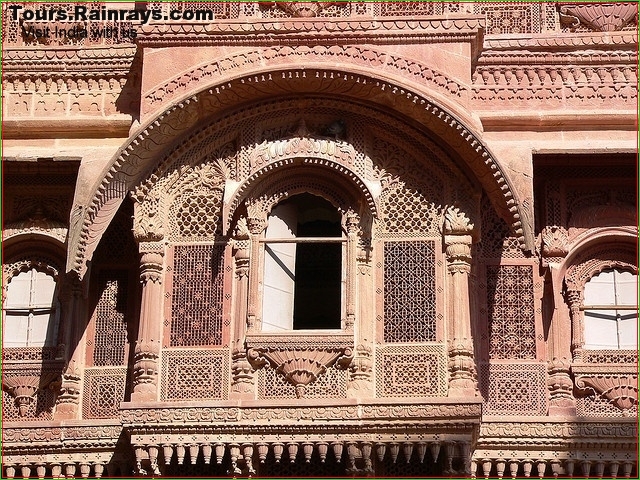 Takhat Vilas : Maharaja Takhat Singh was built the Takhat Vilas between 1843–1873. Fort museum has the rich collection of old royal palanquins, paintings, arms, costumes etc. The museum exhibits the heritage of the Rathores in arms, costumes, paintings and decorated period rooms. 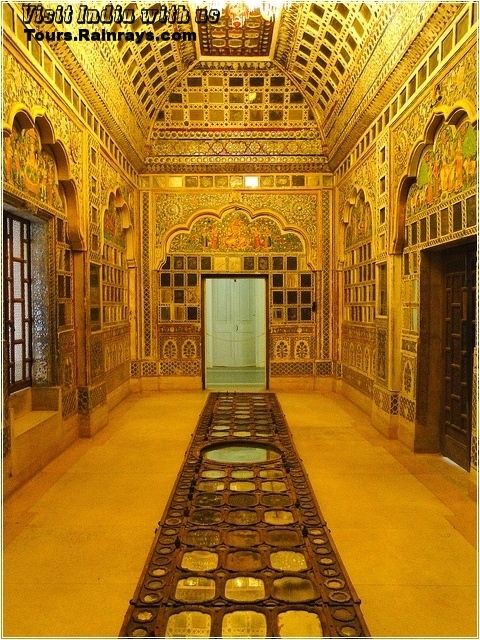 In this Museum you see the folk musical instruments and Marwar paintings. 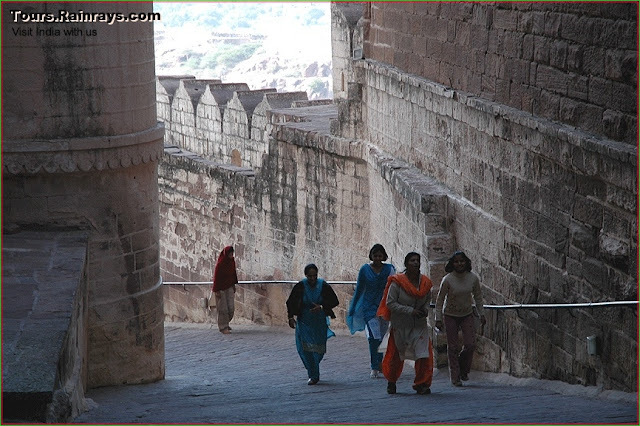 Chamunda Devi Temple : In Mehrangarh Fort there is also a Temple and it is known as Chamunda Mataji Temple. Rao Jodha's was built this temple inside the fort and it is dedicated to goddess Chamunda Mataji. 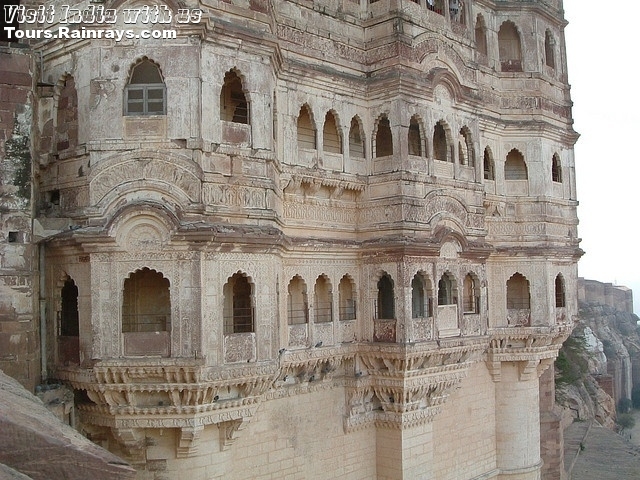 Geological Survey of India has been declared the Mehrangarh Fort as "National Geological Monument". In this Fort there is two tanks that was the main source of water to the residents of the complex. One is known as Gulab Sagar or Rose-Water Sea and other is known as Rani Talao or Queens Lake.